Review in a Nutshell: Lady Midnight is a fantastic read that will hold you hostage until you finish. 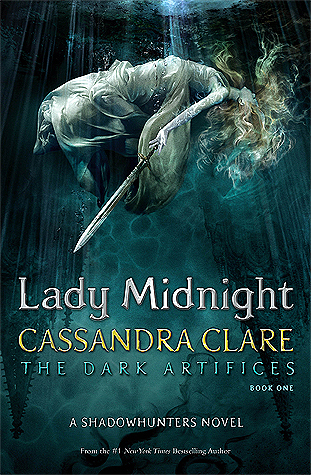 Lady Midnight begins a new series in the Shadowhunter world. You don’t need to have read any of Cassandra Clare’s previous Shadowhunter novels to understand this one, but I would recommend it if you want a deeper understanding. It follows Emma Carstairs and Julian Blackthorn, two parabatai, as they try to unravel a series of murders that could be linked to the murder of Emma’s parents. Each of Cassandra Clare’s Shadowhunters series has taken place in a major city (NYC and London) and this one follows the trend, taking place in the Los Angeles Institute. This new Institute adds a fresh take on a familiar world. While the New York Institute will always be my favorite (I’m a Long Islander, I have to say that), I really loved seeing Shadowhunters on the West Coast. Cassandra Clare’s writing has only gotten better. This book is full of her classic quips and one-liners, and beautiful metaphors. The prose never dragged, and the dialogue was always fun. This book was such a fun read. The plot is fast paced, with constant action and drama to keep you hooked to the pages. There were plenty of twists, and the overall mystery was fun and just challenging enough to keep me interested, but not impossible. Books that heavily rely on a mystery and investigation never really grip me, but this one did. I love all of these characters. From Emma and Julian to little Tavvy, they all have so much personality. Emma is probably my favorite Shadowhunters Chronicles female protagonist, but oh my god do I love every other character in here. Julian was a really refreshing male protagonist. He is such a complex and interesting character, with unique flaws, and is outwardly sweet and caring. All of the other Blackthorns were equally interesting, I especially loved seeing some disability rep with Ty! When it comes to the relationships in this book, I feel like Cassandra Clare just saw how much we all loved the Will/Tessa/Jem love-triangle, and decided she was going to make an even bigger one and make us love it just as much. While I’m not sure if they’re as perfect as The Infernal Devices, I love all of the complicated relationships in this series and how much all of the characters genuinely love each other, and there’s no abusive assholery. I really can’t wait to see where it goes in the next book! With epic action, hilarious lines, and fascinating characters with complex relationships, Lady Midnight is a compelling read that you will never want to put down.